Keurig is a well-known company that based their production on K-cup pods and coffee makers that use K-cup pods. They started their production in 1998. with their first coffee machine and K-cup capsules, and their first targets were offices. But in 2004. they launched their first coffee machine for home use. Now, this company has more than 500 varieties in K-cup pods from more than 60 brands and a great number of fantastic coffee makers. The Keurig is more popular as a manufacturer of a home coffee makers and they have a great choice when it comes to a coffee machine models and their prices are fairly affordable. The creators of a Keurig company had a simple idea, they wanted an office coffee maker that prepares only single serve. They were sick of carafes with cold and stained coffee, so they created coffee machines that use K-cup pods and prepare only single serve, always fresh and tasteful. The first models of Keurig coffee makers were like that. You just had to place a K-cup in its basket and press the button. Simple as that. Every time you wish for it, you can get a nice and hot cup of coffee in just a few minutes. But, the market demand has changed, and the users of Keurig products wanted to have the possibility to customize their drink. That is when the Keurig 2.0 series came to the world. The appearance of all Keurig coffee makers is similar, and they are different in their dimensions and color, water reservoir size and sometimes in brew sizes. They all use the K-cup, K-mug and now K-carafe pods. The Keurig 2.0 series was created because customers wanted a freedom in customizing their beverages. With Keurig 2.0 coffee makers you can set a brew size, brew strength, temperature and you can brew a carafe which is a completely new option. With a K-cup carafe, you can prepare up to 30 oz of hot and delicious coffee. Keurig 2.0 coffee makers use only K-cups created for these brewers. It might seem a little unfair, but every K-cup has a labeled rim and the brewer is programmed to use the best settings for that type of a K-cup. Although the settings are already programmed, you can always change them and customize your beverage according to your desires. Which K-cups these coffee makers use? 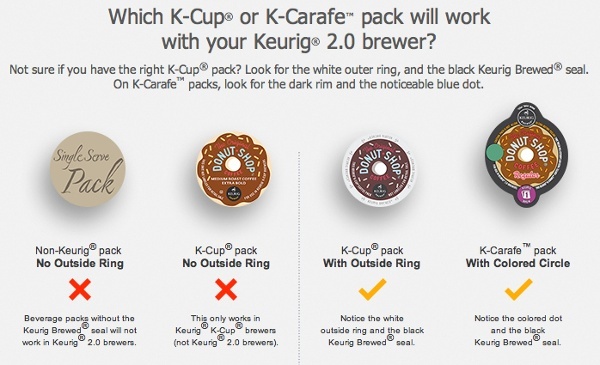 How to know are K-cups compatible with Keurig 2.0 brewer? Keurig 1.0 – the first Keurig series use the older version of K-cups which are not suitable for new Keurig® 2.0 brewers . The thing with this first version of Keurig brewers is that the biggest cup you could brew was up to 10 oz and every setting is preprogrammed with K-cup pods. You can customize your beverage with Keurig 1.0 coffee makers up to the one point which is very modest, and the display implies buttons only. Keurig 2.0 series – with the new version of Keurig coffee machines we have a totally different situation. You can use K-cup pods for brew sizes up to 10 oz, K-mug pods for brew sizes up to 16 oz and finally, K-carafe pods for brew sizes up to 30 oz. The Keurig brewers allow you to use your favorite ground coffee with the reusable My K-cup coffee filter, you can customize your beverage, but you can only use K-cup pods that are labeled for Keurig 2.0 coffee brewers. The display always implies touch-screen. Keurig released many models which are very similar. That is why their potential customers find themselves confused when deciding to buy some of their coffee makers. We will list all their models with just a brief introduction to their features. Down below we will use the expression „no water filter“ which means that the package doesn’t include water filter but it is recommended to use it. Keurig K40 – elite model, 48 oz water reservoir, uses all types of K-cup pods and My K-cup reusable coffee filter, auto ON/OFF option, has a selector for brew size. Keurig K55 – elite model, 48 oz removable water reservoir, no water filter, brew size max 10 oz, brew size selector, use all types of K-cup pods and My K-cup reusable coffee filter, auto ON/OFF, this is a budget model and it is a favorite among all Keurig coffee maker users. K55 is best selling single serve coffee machine. Keurig K60 – special edition model, discontinued, 60 oz removable water reservoir, no water filter, temperature control, brew size max 10 oz, auto ON/OFF, programmable timer, use all types of K-cup pods and My K-cup reusable coffee filter, one-touch brew button. Keurig K65 – special edition model, discontinued, 60 oz removable water reservoir, brew size max 10 oz, one-touch brew button, no water filter, has temperature control, programmable timer, auto ON/OFF option, uses all types of K-cup pods including the My K-cup reusable coffee filter. Keurig K70 – platinum plus model, 72 oz removable water reservoir, no water filter, uses all types of K-cup pods and reusable My K-cup coffee filter, brew size max 12 oz, one-touch brew button, has temperature control, programmable timer and auto shut ON/OFF. Keurig K75 – platinum plus model, 72 oz removable water reservoir, includes the water filter, one-touch brew button, brew size max 12 oz, temperature control, use all types of K-cup pods and My K-cup reusable coffee filter, programmable timer, auto shut ON/OFF. Keurig K79 – platinum plus model, 72 oz water reservoir, no water filter, brew size max 12 oz, use all types of K-cup pods and reusable My K-cup coffee filter for your favorite coffee ground, one-touch brew, hot water and rinse buttons, programmable timer and auto ON/OFF option. Keurig K130 – commercial model, slow in brewing, no water reservoir, brew size max 8 oz, auto shut-off option, uses all types of K-cup pods including the reusable My K-cup coffee filter. This series of Keurigs’ coffee makers are the new version of Keurig 1.0 models. Some of their features are upgraded and they can use only K-cups labeled to be for Keurig 2.0 models. Keurig K145 – commercial office-pro model, 48 oz water reservoir, brew size max 10 oz, uses only 2.0 licensed K-cups, no water filter, auto shut-off option, brew, power and drain buttons, brew size selector, very similar to a K140 model. Keurig K150 – commercial office-pro model, 90 oz water reservoir, no water filter, can be connected to a water plumber but you will have to buy that kit separately, has a temperature control, brew size max 12 oz, use only 2.0 licensed K-cups, programmable timer, auto ON/OFF option. Article about Difference between Keurig K150 and B150 for those who want to know more. Keurig K200 – plus model, 40 oz water reservoir, 10 brew sizes, max brew size is 30 oz, include water filter, use 2.0 licensed K-cup, K-mug and K-carafe pods and My K-cup reusable coffee filter, has a strength control, brew selector for different beverages, black and white touch-screen. Keurig K250 – plus model, 40 oz water reservoir, 10 brew sizes, max brew size is 30 oz. Keurig K300 – plus model, discontinued, 60 oz water reservoir, max brew size 30 oz, 10 brew sizes, no water filter, use licensed 2.0 K-cups, K-mug, K-carafe including My K-cup reusable coffee filter, has a strength control. Keurig K400 – plus model, 70 oz water reservoir, max brew size 30 oz, 10 brew sizes, no water filter, use only licensed 2.0 K-cup, K-mug, K-carafe including reusable My K-cup coffee filter, auto ON/OFF option, color touch display with wallpaper, has temperature and strength control, includes carafe. Keurig K425 – plus mode, 70 oz water reservoir, no water filter, practically the same as the K400, only this model doesn’t include carafe. Keurig K450 – plus model, discontinued, 70 oz water reservoir, includes water filter, max brew size 30 oz, 10 brew sizes, has temperature and strength control, auto ON/OFF option, includes carafe, use licensed K-cup, K-mug, K-carafe pods, and My K-cup reusable coffee filter. Keurig K525 – plus model, 80 oz water reservoir, includes water filter, max brew size 30 oz, 10 brew sizes, large touch screen, has temperature and strength control, auto ON/OFF option, use licensed 2.0 K-cup pods and My K-cup reusable coffee filter, this model doesn’t include carafe. Keurig K545 – plus model, 80 oz water reservoir, no water filter, 10 brew sizes, max brew size 30 oz, use licensed 2.0 K-cup pods and this model includes My K-cup reusable coffee filter in the package, XL touch screen, has temperature and strength control, auto ON/OFF option, doesn’t include carafe. Keurig K550 – plus model, 80 oz water reservoir, includes water filter, includes carafe, 10 brew sizes, max brew size 30 oz, has temperature and strength control, auto ON/OFF, use licensed 2.0 K-cup pods and My reusable K-cup coffee filter. Keurig K575 – plus model, 80 oz water reservoir, 10 brew sizes, max brew size 30 oz, includes water filter, auto ON/OFF option, use licensed 2.0 K-cup pods and My reusable K-cup coffee filter, hot water on demand, has temperature and strength control, large color touch-screen. Keurig K3000SE – the commercial model, has a direct water line, doesn’t include water filters, use licensed 2.0 K-cup pods, max brew size 10 oz, 4 brew sizes, has temperature and strength control, used capsules drawer with 35-40 capsules capacity, hot water on demand. Which one series to choose? If you have carefully read the section about Keurig models, no matter which series they belong to, you can see that the biggest difference is the water reservoir, the ability of certain brewing pods and the accessories you get in your package. If you are not that picky when it comes to coffee, the Keurig 1.0 series models will work just fine, but if you like to prepare your coffee according to your desires than some of the Keurig 2.0 coffee makers will do the work. You should also take into an account the use of coffee maker, will it be an appliance in your office or house, and of course, the most important, price. We all know that the wallet thickness impacts our choice on many occasions. Many factors can affect your decision, so it is much better if you have detail information about models that attract your interest. Of course there are many who will certainly not agree with my choice, but if I have to choose the three best Keurig’s brewers, I would choose K575 in the first place, in the second position would be K55 and that’s my final decision when it comes to the best models from the Keurig 1.0 and Keurig 2.0 series. With many additional options, possibility to brew a whole carafe and the luxury to customize your beverage according to your desires, we have to say that the Keurig 2.0 series is our choice. If you have supplies of K-cups that you cannot use with 2.0 models, just give them away to someone who can use them and start your mornings with some of the best coffee variations that only K-cups can offer you. Next story How Long Do Roasted Coffee Beans Last?